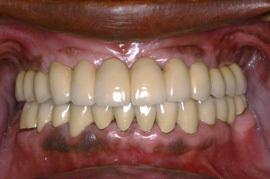 This is a 59-year-old female patient who had severe gum disease and multiple missing upper front and back teeth. 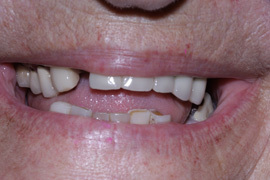 She was wearing a removable partial denture to replace her missing front teeth. 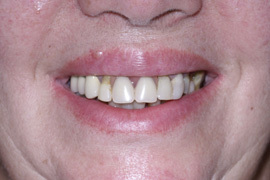 During her Teeth-in-a-Day procedure, she had her remaining infected upper teeth removed, six implants placed, and a fixed implant bridge attached to implants. 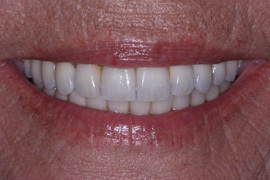 This procedure (called “Teeth in a day”) allows patients to transition from hopeless to fully restored in one appointment without having to wear removable dentures. This patient had minimal swelling and discomfort after her procedure and was able to come back to her everyday life the next day. 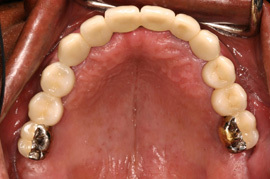 This is a 67-year-old female patient who had a collapsed bite due to missing back teeth. 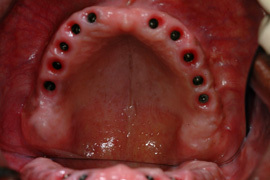 She was wearing a removable partial denture that was very uncomfortable. 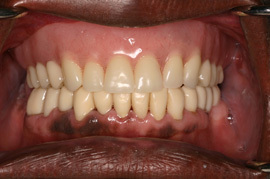 Her remaining teeth had defective crowns, cavities, and infections. 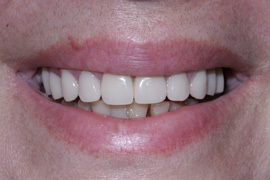 Because of her bite and tooth position, she never had good lip support or a nice smile. While under IV sedation, she had all her remaining teeth removed, 8 implants placed, and fixed bridges attached to the implants on both jaws. All these procedures were done in one appointment (called a “Teeth-in-a-Day procedure“) with minimal post-operative pain or swelling. Contact Dr. Olga Malkin from Tribeca Advanced dentistry today!